Will I ever show you my scars? I doubt it. But here are the radiation target marks with my camera covering my breast. “The beam becomes my dream” and my dream is the return of my healthy body. The lyrics to the old Blondie song ran through my head yesterday as I lay on some sort of huge radiation machine while techs determined exactly where to position me when the actual process begins at 8:30 a.m. Monday. I decided on a smart and patient radiation oncologist in Fresno. He did his residency at Stanford, knows and wants to work with my oncologist, Dr. Carlson, specializes in breast cancer and he’s also a physicist. A very smart man. I feel good about my choice and being able to stay at home instead of living in Palo Alto for six weeks to get radiated at Stanford. Yesterday technicians marked my chest heavily with a black Sharpie as part of the “getting ready” process. Today I look like those drawings showing how to quarter a cow. It was a sobering experience in a long list of them. They took X-rays to determine exactly where the radiation will be directed. I had to lay on the table naked from the waist up for about 45 minutes, careful not to move even a millimeter inside the mold of my body they made to keep me in place. The entire time I could see my butchered reflection in the glass plate that covered the machine hovering above me. The actual reflection prompted a mental reflection on my predicament. Despite all of the love and support, I am alone in the actuality of what happens to me. Alone in the chemo chair, alone on the surgeon’s table, alone and scared in the radiation room. It’s hard to cry and hold perfectly still at the same time, but I managed. Someone wiped my tears. I was grateful for and comforted by that act of human kindness. My radiation oncologist calls me an “intermediate to high risk” patient as he talks about the aggressive plan of attack on the place where my breast was and the neighboring lymph nodes. 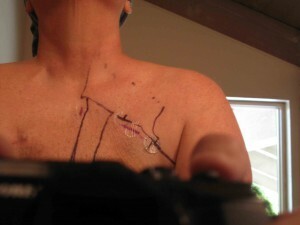 Radiation will be directed along my right breast scar and to the right clavicle. Because my chest is wide, I’ll get an additional dose along my breastbone. That allows the scar beam to be directed shallower to avoid scarring lung tissue. Brilliant! My doctor’s “risk” description refers to the chance of recurrence. It pains me to hear what I already know. BUT I had the world’s best breast cancer oncologist directing my treatment, had exceptional reaction to my chemo and trial drug, I had a fantastic surgeon remove my cancerous areas, I will get Herceptin for a year and a hormone-suppressing pill for 5 years, I made lifestyle changes to detox my body and make me healthier and stronger, and now radiation will target the neighboring areas where cancer cells might be lurking. Each reduces my risk considerably. At the end of my session a compassionate technician walked me back to the dressing room. She told me that she, too, is getting cancer treatment at Stanford. So I’ll add one more thing to the list of reasons I believe this cancer is gone for good. I have been my own healthcare advocate. I have tracked down and secured the very best doctors to treat my particular disease. Faith! Gotta have it. Gotta keep it. Faith! You have it! We have it! Yes, you are alone…but you are NOT alone! Heavy. Showed Jake your picture. He asks when do you grow your hair back? Glad radiation is local for you. If you can break away from Fresno consider a spin to Castro Valley for fun on 11-25 or 26?